Re-opening of McDonald’s restaurant near Asecs shopping centre, Sweden. ROL Fredbergs have completed yet another turnkey project. 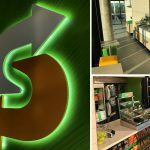 After 6 weeks of refurbishment work, the restaurant has got new floors, new furnishings (LIM Extreme 2.0 concept), rebuilding of kitchens, moving walls, expanding McDrive, new roof, new staff rooms and offices, new cash dispensers and installation and system integration of 12 self-service stations. Even though the restaurant is one of the busiest in the Nordic region and so extensive rebuilding, the restaurant has been able to stay open for 5 of 6 weeks thanks to ROL Fredbergs experience of project management of this type of turnkey project. After a successful opening on the planned date we wish the restaurant and its staff a good luck in the future.